Disclosure: This is a compensated post in collaboration with Sabra Dipping Company. I am sharing this awesome recipe here and on a live cooking segment on KATU AM Northwest! Are you going to watch the Superbowl this weekend? It’s kind of a big deal for us in the Pacific Northwest, being that the Seahawks are in the bowl. So here is my confession, I don’t watch football, I only watch the Superbowl. That’s it. I may watch one other game during the season, but only of the Seahawks and 49ers are playing. Other than that, no football for me. 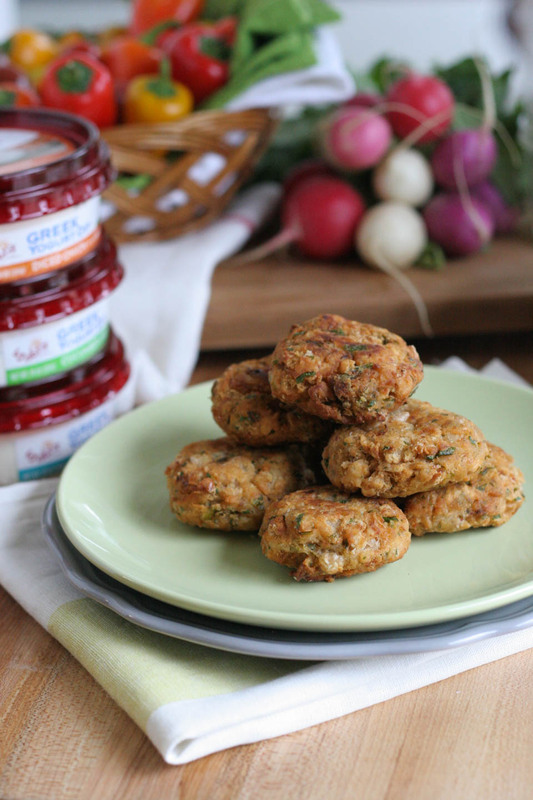 But this is an extra special game, and I’ll be on ABC’S KATU AM Northwest sharing this awesome classic falafel recipe, and other ways to use this tasty Sabra Greek Yogurt Dip with fresh and roasted vegetables, crackers and chips. A great way to have a fresh healthy dip choice for the game time and at any event you throw. I love chopping up jicama for this dip too, way better than chips! We all love a good greek yogurt, and my favorite part about Sabra’s dip is the quality and freshness. They hand chop fresh vegetables and herbs to mix into this small batch product. What’s not to love about that?!! While it’s most popular as a dip, I totally add it to soups as a garnish, so good. This weekend I’ll add it to my chili instead of sour cream. Less fat, higher protein, and delicious. 1. Place garbanzos, parsley, garlic, lime zest and juice, paprika, and salt in a food processor. Pulse until medium crumbles. Do not over mix, or it will turn into hummus. Add flour, and lightly pulse for 10 seconds. You can also chop the parsley and mash the beans by hand, then mix all of the ingredients together in a bowl if you do not have a food processor. 2. Make disks about 1/2 inch thick, the size of a gold ball. Place on parchment lined baking sheet. Place in oven and bake for 20 minutes, or until golden brown. If frying, place pan with oil over medium high heat. Once shimmering, add 4 falafels at a time. Cook for 2-3 minutes on each side, or until crispy golden brown. 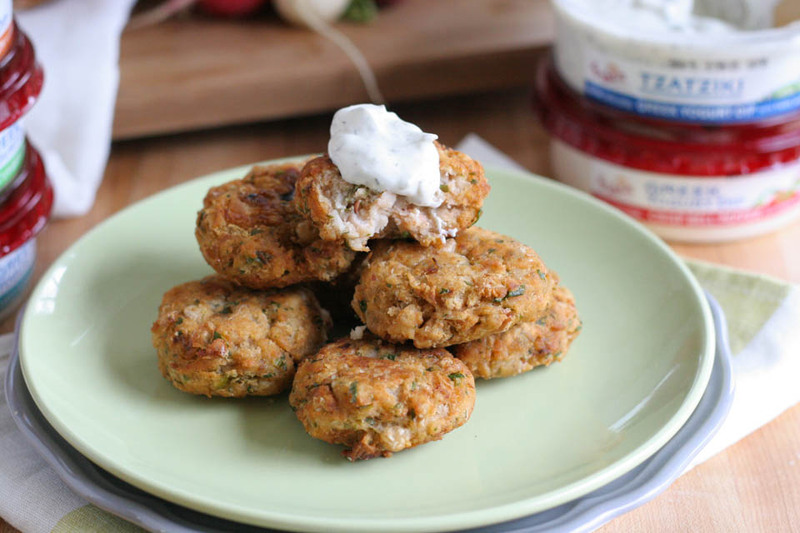 Serve warm with Sabra Greek Yogurt Dip for the Superbowl, any party, or a weeknight dinner! Congrats on your TV segment! How exciting! These falafel sound delicious! I need to try Sabra’s yogurt dip! Thank you! I love doing them, it is so fun. That’s my idea of a perfect snack OR meal! Good call, me too. I love this stuff. I’ve had falafel with the dip and naan for days now. They are so good, you’ll love it! 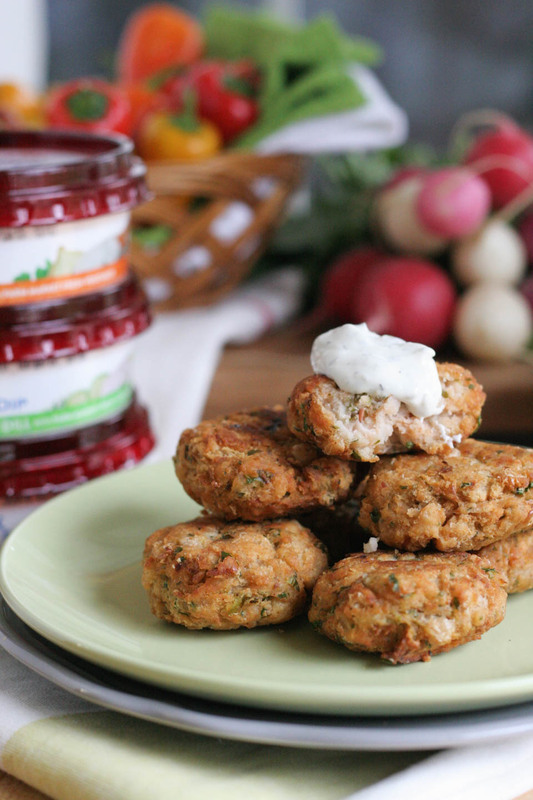 These falafels would be perfect for an appetizer option plus the yogurt is a win-win. This looks delicious. I like the yogurt dip you created for this. So simple! I need to find some Sabra dips. I agree, they are a nice thing to have around! These sound absolutely perfect! I can’t wait to try them. Oh I had no idea they make yogurt dip! I’ll have to check that out!